It's Fall and i don't know about you but a warm bowl of chilli is perfect. I love this recipe because it's a nice change from tomato based chili! Put soaked beans in Medium-sized saucepan and cover with water. Bring to boil and simmer 20 minutes. Brown chicken. if desired in 1-2 Tbsp. oil in skillet. Cover. Cook on Low 10 to 12 hours, or on High 5 to 6 hours. Ain't really chili, now is it! 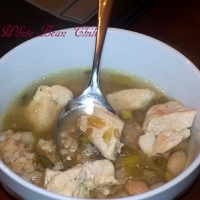 See White Bean Chili for more.